Imagine the world without panda bears, cheetahs, rhinos, and sea otters. The Earth wouldn’t be the same! 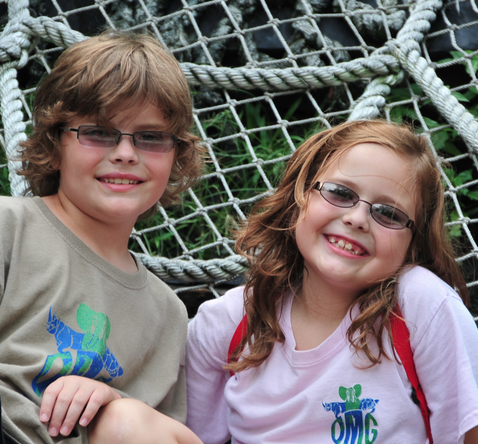 Carter, 11-years-old, and Olivia, 10-years-old, have been working hard for the last three years to help ensure that when we grow up and have families of our own, our children will get to see all of these endangered animals! They even have their own nonprofit organization, One More Generation, which serves to help endangered species. 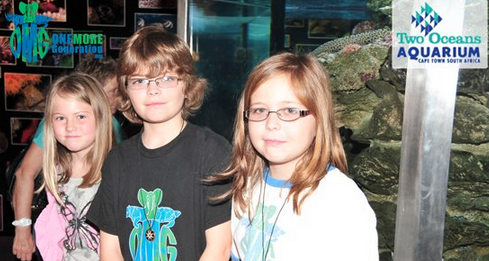 Carter and Olivia have been working to save endangered animals since 2009. Keep reading to find out about One More Generation, and see what you can do to help out endangered animals! One More Generation and Beyond! 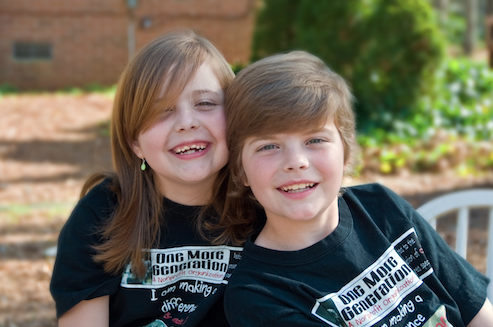 Carter and Olivia founded One More Generation (OMG) in 2009. After adopting cheetahs in South Africa for several years, the siblings found out that endangered species like the cheetah may not survive another generation. “I told my brother we had to do something,” Olivia said. OMG is dedicated to saving endangered species and the environment. With the progress that OMG is making, and with help from readers like you, we can help all endangered species survive One More Generation, and beyond! Saving the world one project at a time! Carter and Olivia have done incredible work since founding OMG. They’ve traveled to South Africa with the Ann van Dyk Cheetah Centre and got to feed their cheetahs, convinced a town in Georgia to stop hosting their annual Rattlesnake Roundup, and even delivered supplies to the Gulf to help the animals who were affected by the BP oil spill. “It was great to see that all our supplies helped make a difference,” Carter said. 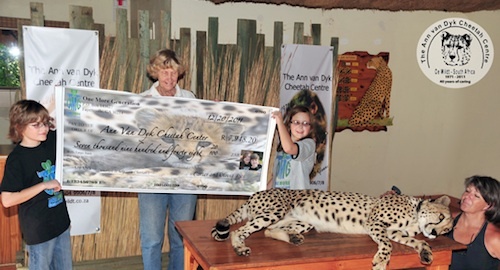 Olivia and Carter presented a large donation check to the Ann Van Dyk Cheetah Centre, and to the founder, Ann Van Dyk! The siblings also present to others on how to save the environment. In early November, they spoke at the College of Charleston South Carolina and the East Cooper Montessori Charter School. Carter and Olivia were invited to tour the Two Oceans Aquarium in Cape Town, South Africa and speak about their Plastic Awareness Coalition. Board member Robyn Cant-Haylett (standing next to Carter) joined them! To stop plastic pollution, recycle as much as possible! “We all need to recycle everything we can, and we need to find ways to reduce our dependency on items made of plastic,” said Carter. Read more about plastic pollution at the One More Generation Website. OMG needs your help! They have recently partnered with Strategic Protection of Threatened Species (SPOTS) to raise awareness of the poaching problem in South Africa. OMG hopes to make sure that Rhino’s won’t go extinct. “Rhinos are being poached at a rate that will make them extinct in our lifetime,” said Olivia. “Kids can help by writing letters or drawing pictures and sending them to us,” Carter said. If you are interested in writing a letter to help save Rhinos, address it to President Zuma of South Africa, so he and his government become involved in saving these animals! 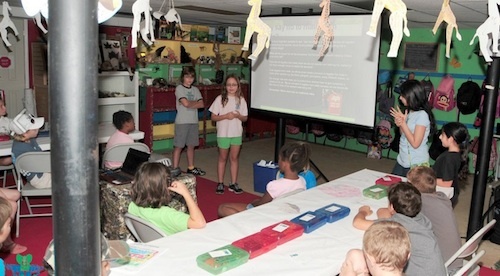 The Ries presenting their rhino letter writing campaign to summer camp kids at The Cochran Mill Nature Center. OMG is trying to collect 1,000 letters or drawings. These will be delivered to President Zuma in the spring of 2013! “We hope to make him realize that kids and adults all over the world care about Rhinos, and that he needs to do something to protect these amazing animals,” Olivia said. You can find examples of how to write your letter on OMG’s website. Letters can be emailed to OMG at info@onemoregeneration.org or mailed to the below address. Changing the world doesn’t have to be hard! You can start by following Carter and Olivia’s advice on recycling plastic, or participate in their rhino letter writing campaign! If you are doing something in your community to make a difference, let Amazing Kids know! Do they know about Vaquitas?